At one point, he had a really hard time balancing the boards on the different cones and objects that he was using for that purpose. I watched him closely to see if he would get frustrated, but he simply kept right on working and adjusting, trying to get everything to fit and stay the way that he wanted it to. When he was done, the results were very impressive. I have watched children like this for a while. When they are creating and they are really in that creative zone, they don’t seem to get as frustrated as they would if they were being asked to do something or if they aren’t in that zone. They work harder and smarter and really focus on what they are doing. They don’t really give up until they get so frustrated that they have to walk away – and then they walk away. They don’t fuss or cry or scream, they just simply walk away. The differences in attitude between the children who get in this zone and the ones who don’t are so astounding to me. I experiment with different materials in the classroom all the time to try to find things that allow children to enter into this state of focus. 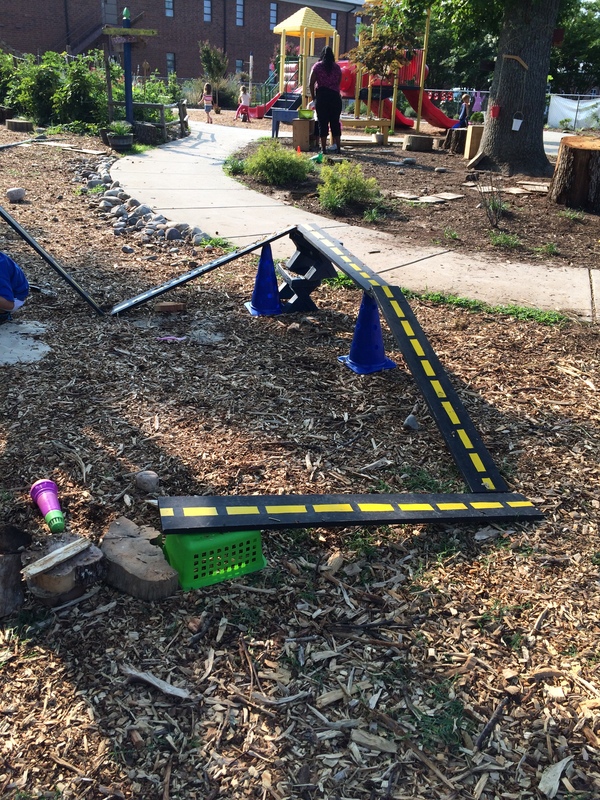 Open-ended materials, loose parts – these are the materials that guide children into flow. They are much better than the plastic toys that most manufacturers market as the best toys for children. Children don’t need fancy toys to create. They simply need real, found materials, some time, and some patience from us. When they have those things, they have super-focus and the perseverance to build amazing structures, all on their own. In the roughly one-third of the day that is free of obligations, in their precious ‘leisure’ time, most people in fact seem to use their minds as little as possible. The largest part of free time – almost half of it for American adults – is spent in front of the television set. The plots and characters of the popular shows are so repetitive that although watching TV required the processing of visual images, very little else in the way of memory, thinking, or volition is required. Not surprisingly, people report some of the lowest levels of concentration, use of skills, clarity of thought, and feelings of potency when watching television…the information we allow into consciousness becomes extremely important; it is, in fact, what determines the content and quality of life. I’ve been doing some form of project work with my classes for the last two or three years. It hasn’t been quite as structured as I’m learning to do project work because I didn’t have as much knowledge about it, but it has been there, based on what I learned through the reading that I did do. As I work in a center that is more focused on providing opportunities for project work as an educational philosophy, I grow to appreciate the flow of the project and of the day. There are times when the teacher has to facilitate a discussion, or plan an activity, or devise an addition to a center to enhance play. And then there are times when the teacher needs to just stand back and watch it all unfold. I have long been a proponent of observation as a key – THE key – to high-quality teaching. There is no way to know what the class is interested in without observation. There is no way to know what the children are learning from discussions without observing them as they play to see what aspects of the discussion they are carrying with them and using. There is no way to know what direction to take the project without watching observing to see what the children are wondering or what misconceptions they show through their play. There is no way to truly understand the hearts of the children in the classroom without observing them. Observation is so important, and taking the time to observe actions, words, and interactions is the key to being able to figure out what truly needs to be taught. Academic knowledge is wonderful and it has its place in my classroom, but I like to think of myself as a teacher of life. In order to teach about life, I have to clue myself in to the lives of the children in my care. I can’t do that by standing in front of them spouting out facts and then viewing their play time as a time for me to get some of my busy work done. I am just as involved in their play as they are, but I am noticing, noting, planning, questioning, and documenting. I am finding ways to help their learning come alive. Taking time to be still and let the children show me their lives is an essential part of the flow of the project.